The purpose of this page is to bring to the cruising sailor a method of adding a SSB antenna to their yacht. 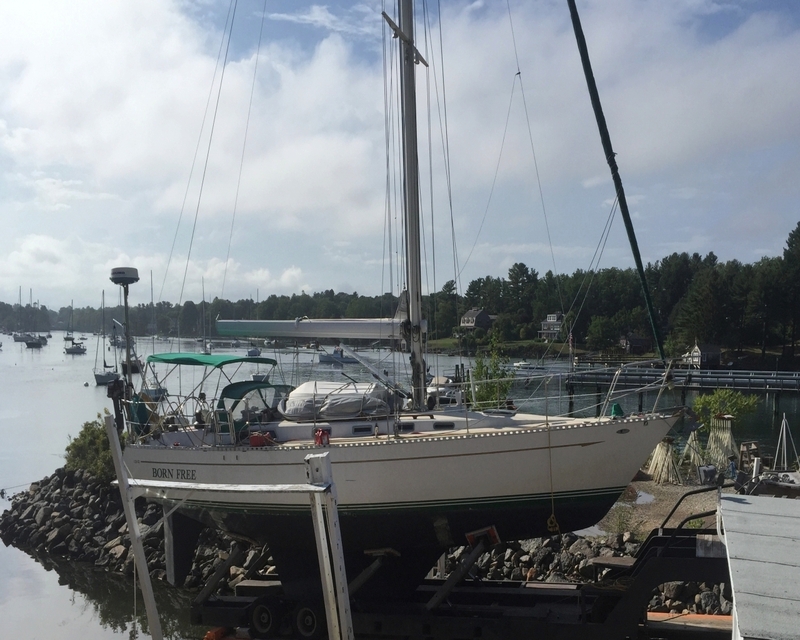 Bill Trayfors has provided information and construction details of a single band HF antenna that can be installed on a sailing yacht with a spare halyard. 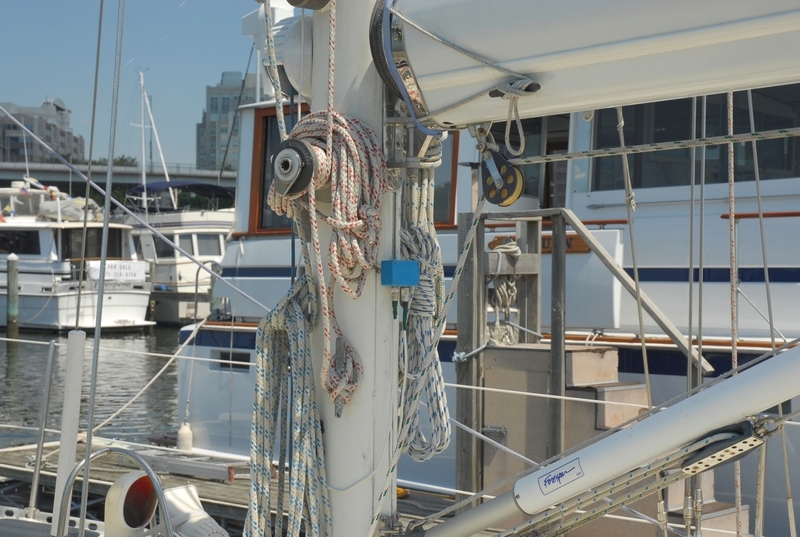 If one does not have a spare halyard (which my boat did not), it would be very easy to install one. Adding a single band antenna brings to the user the ability to have a tuned radiator without the need for a counterpoise system. If the antenna is tuned correctly for the lowest SWR, one can eliminate an auto tuner. Having several tuned antennas on board and one can have a tuned antenna farm on their vessel. Most cruisers stay on the frequency/channel they feel most comfortable. With multiple single band antennas, many possibilities exist to fit one's needs for SSB operations. Below one will find the construction details for the single band vertical dipole. This information comes from Bill Trayfors and is reproduced with permission. Copy and save this page, but if one would like to add the information on their boat's website, please contact WA6CCA (via QRZ.com) and obtain his permission. That would be the correct thing to do. I have built a 20m version of this antenna for 14300 kHz (Maritime Mobile Service Network,a Ham based network around the world). I have found that the total length of 30 feet 7 inches is way outside the normal amateur band and put the antenna at 15.3 MHz. This is due in part to the surrounding hardware on my boat. 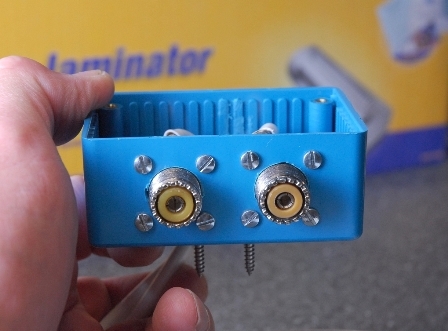 Once you build yours, you may have to shorten the antenna due to the hardware on your boat. The goal is 1.2:1 or better SWR. However, do not fret if you cannot reach that. My antenna is 1.5:1. Still very acceptable for my radio. NOTE: Bill Trayfors became a Silent Key on 15 February, 2019. He will be sorely missed. S/V Born Free. One dipole is visible aft of the roller furling headsail. Two dipole antennas visible in this image. Coax leading to 20 meter dipole on port side bow. 8 MHz dipole is visible on starboard bow with the coax feed at the top of the image. Before we get started on building the dipole antenna, let's look at some the pros of why one would want to have this type of antenna over the conventional backstay antenna. 1. The antenna is TUNED to the operating frequency. This means there is no tuner and no 100 sq ft of copper between the radiating element and the source of the radio signals. The only "resistance" to the signal flow is the coax cable. There is loss inherent in the cable. That is the nature of coax, but the loss is minimal. 2. A dipole antenna is an very efficient radiator. When the antenna is cut to resonate on a specific frequency, the SWR (Standing Wave Ratio) is at it minimum allowing ALL the energy presented at the feed point to be radiated. This in itself gives you the sailor a better signal than a vessel using their backstay. 3. Robustness! An antenna needs to be able to withstand extreme harsh condition while at sea. With this antenna, there is no fear of losing a rig due to mechanical failure of a backstay insulator. The material chosen for this antenna have been proven over time to withstand hurricane force winds. Copper wire, (known throughout the Ham Radio community as being the material of choice for dipole antenna construction) does not have the characteristics of robustness in a marine environment. If it did, would it not be used for all the standing rigging on a sailboat? Copper also has a stretch factor that would need to be taken into consideration. Copper is a great product for home antennas, but Stainless Steel Lifeline material is the material of choice for a robust, rugged, HF SSB Vertical Dipole antenna..
To use a dipole antenna, it would either be a single-band tuned dipole (for one band only) or a multi-band dipole. The latter would require open wire or balanced feed line and, while an effective antenna, is not particularly well suited to the marine environment. The feed line tends to blow and bounce around a lot in rough weather. 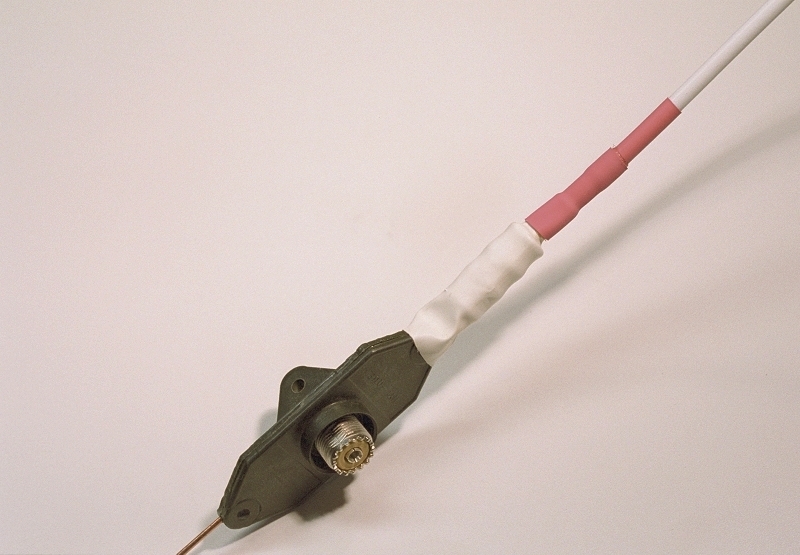 However, at anchor or in port, this type antenna can work well. The G5RV and G5RV Junior antennas are a good example. Rigging an efficient SSB antenna on a ketch is always a challenge. I have a friend with a 56' LOD ketch who's solved the problem by using the topmast shroud on his mizzen antenna and a jumper wire up to the triatic stay. He's using a 4:1 UNUN at the base, going to an automatic tuner belowdecks. It works pretty well. Many ketches use a single backstay on the main. Some use whip antennas on the stern. 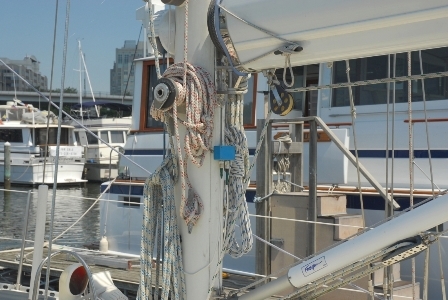 There are many potential solutions, depending on your specific rigging details. Few are really great antennas because of the incredible amount of rigging required for the ketch rig. Most are workable, though. 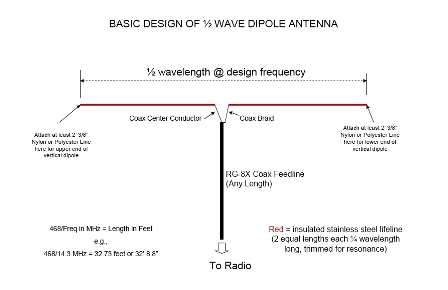 The term dipole implies it is cut to a resonant length which would limit you to only a small frequency range. 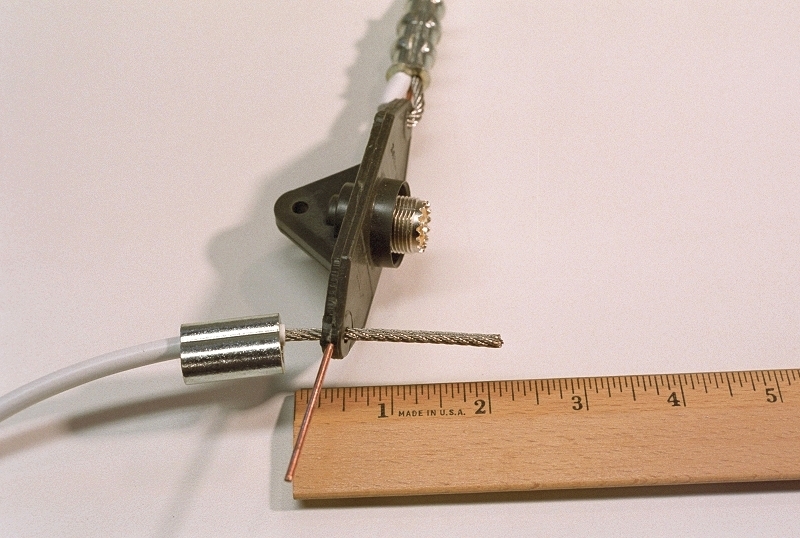 You can construct a multi-band dipole using different resonant lengths of wire fed at a common point as well. This doesn't require open wire feed line. You can run coax to the common feed point typically a BALUN There are various frequency calculation charts and formulas all over the Internet for reference. The added benefit is that no tuner should be required. 2. Multi-band dipoles can be constructed in several ways, including the one I mentioned: using a balanced feed line instead of coax, and a tuner. This works very well but, again, isn't really practical for a seagoing boat. 3. Another way to make multiband dipoles is to use traps. However, these, too, are impractical in the marine environment. 1. Single-band VERTICAL dipoles are GREAT DX antennas, and work very well in the marine environment, especially for 10 MHz and above. They do not require a tuner, and can take all the power you can feed them. 2. Multi-band dipoles -- however constructed -- are not likely to be long-lasting in a real marine environment. 3. The best versatile, all-band antenna for a sailboat is either a random-length wire (like an insulated backstay or alternate backstay) fed with an auto tuner, or a vertical whip also fed with an auto tuner. On my 42' sloop I have all three: an insulated backstay with an auto-tuner; vertical dipoles for 20m and 15m; and a stern-mounted mobile whip antenna with resonators for various bands. It's interesting to compare their effectiveness on various bands and over various signal paths... something I've done for several decades. Here is a step by step approach for building a Vertical Dipole antenna based on the frequency of 14300 kHz. These are the simplified steps. Images of the steps are depicted below. One not need follow these steps, but it will help to read them and look at the images to get a better mental picture of what one is doing. Note: for other bands, one will need to determine the initial length of S/S Lifeline cable needed. i.e. 8 MHz will need approximately 60 feet of cable. See the Basic Design below for more information. 1. Cut the 36 ft 1/8" Stainless Steel Lifeline cable in two, making 2x18 ft each. 2. On one cable, strip off enough insulation to allow a loop to be formed and crimped on the HQ-1 center insulator. 3. Slide on the Nicopress crimp sleeve. 4. Insert the 1/8" SS Lifeline through the hole of the center insulator. 5. 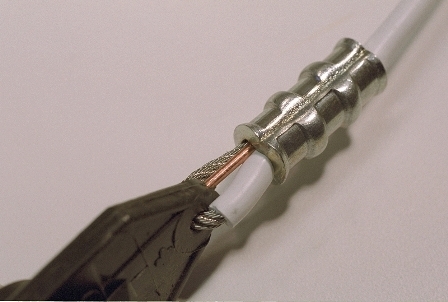 Fold back the 1/8" SS Lifeline cable and join with the copper conductor. 6. Slide the Nicopress sleeve over both cable and conductor. 7. Crimp the sleeve and inspect your work. 8. Apply heat shrink tubing once everything done. 9. Raise the antenna and follow the tuning procedures outlined below. 10. And most of all... have fun! Qty 36ft - 1/8" Stainless Steel Lifeline Wire Rope. Budwig Hye-Que HQ-1 center insulator with one end made up using 1/8" S/S lifeline (1/4" OD) and 3/16" Nicopress sleeve crimped into position. Note that the amount of insulation on 1/8" lifeline varies by manufacturer, with some using thicker insulation than others. Choose Nicopress0 sleeve sized for your lifeline. 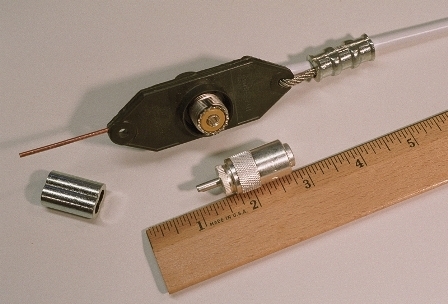 For illustration, PL-259 connector and RG-8X coax are shown connected to the HQ-1. Close up of the SS wire rope crimped to the conductor of the HQ-1. If you look closely, you can see the + for the center pin of the HQ-1. KF6BL Note: Bill decided to cut the entire insulator off before crimping. This provided for a better fit. I did the same on my antenna. Detail of insulation stripped off of end and inserting into hole on HQ-1 before bending back alongside copper ear and slipping into other side of Nicopress sleeve. KF6BL Note: if the holes of the HQ-1 are too small one will need to drill out to fit. HQ-1 spec says hole is 1/8" but my cable did not fit. Shows completed end, with heat-shrink. Red heat-shrink is to identify the + (Plus) side, i.e., the side connected to the center conductor of the RG8X feedline. This side will always be pointed to the top of the mast. KF6BL Note: there is a + located on top of the HQ-1. No need to use a DVM to find the center pin conductor. Stainless Steel Life Line, 1/8" - This is vinyl coated for protection. This is the material of choice for ruggedness and durability in the marine elements. There are multiple sources for this material. The insulation may vary in thickness. Nicopress Crimp Sleeves - The are oval shaped sleeves that come in copper and zinc-plated copper. They are 3/16" and are model number 18-6-X. Based on the thickness of your insulation, you may need smaller/larger sleeves. If you will be removing all the insulation under the crimp, you will need the 1/8" crimps. Not listed but recommended are ceramic egg insulators. These will be used at the ends of the antenna for strain relief. If you want to keep the aloft weight down, then these are optional. 1/2" Dacron or Polyester rope make a good end insulator. Coax cable should be the best quality low loss available. Marine Grade RG-8X, Amateur Grade RG-8X, or LMR-240 coax is preferred for weight and attenuation (low loss). The length is not critical but should be long enough to reach your radio. PL-259 (UHF) connectors should be silver coated and the best quality. They should be the solder type, not the crimp type. Heat Shrink tubing will be dual wall adhesive. Ensure that the tubing is wide enough to fit over the crimps or PL-259. If the area to protect is too narrow for your tubing, use smaller tubing or self-amalgamating tape to build up these areas. 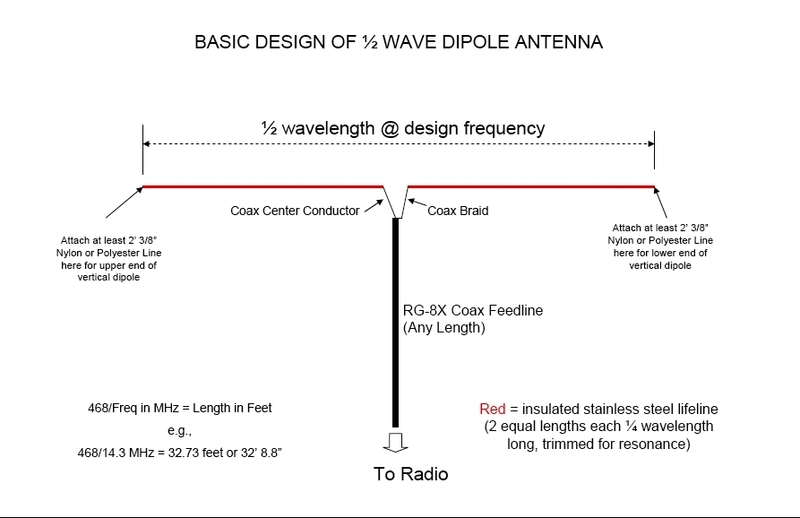 For those sailors who are not Ham Licensed, here is a basic design of a 1/2 Wave Dipole Antenna. Before doing anything else, you might want to download the PDF that maps out the complete tuning process. Read it over several times and when it says take a drink of beer, I recommend doing that. I found out that NOT following the process could lead in cutting the antenna too short. Hence, this is why I have a 1.5:1 SWR. Should have followed Bill's procedures. Note: Because of the material used in construction, the final antenna length will be shorter than what the formula states. An example - The 20m dipole version came in at just over 31' 2" compared to the formula length of 468/14.3 = 32' 8.7" --- more than a foot shorter! So with this in mind, the total length of the antenna before tuning will be the formula length. OBJECTIVE: To obtain a very low SWR (1.2:1 or better) at the operating frequency by successively shortening the dipole by trimming its ends in equal small amounts. Progress is to be monitored using a good SWR meter. NOTE: this is a bit of a chore to do in practice with the "marinized" dipole described, since it's the 1/8" insulated lifeline that's to be trimmed back, and each time reformed into a small loop through a Nicopress sleeve. So, pick a nice day, open a bottle of beer and plan to spend a little time doing it right. Don't hurry this process, because if you cut off too much, you'll essentially render the dipole worthless... at least without a tuner. 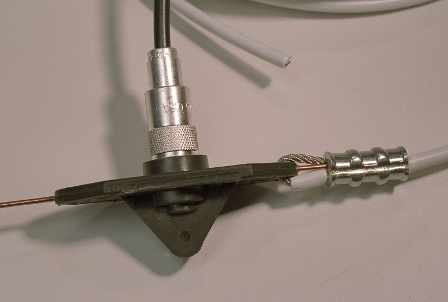 RESULT DESIRED: A dipole which can be used without a tuner, connecting directly to the transceiver (preferably through an antenna switch and a good SWR meter). Here are the procedures in a simplistic format. Key to success is to take one's time and go slow. Details are in the PDF file. 1. Have on hand about two feet of rope to use as "end insulators" for hauling up the antenna. 2. Form loops in the end of the antenna. Make sure the length on both ends are symmetrical (equal). 3. Secure the negative (-) end to the toe rail (bow or stern, where ever you would like the antenna to be) and haul up the positive (+) end. Make secure but not so tight that the loops are pulled out. 4. At the radio, measure for SWR. (One will need a radio that has a VFO and a SWR meter to perform this step as outlined in the PDF document. If lacking these tools, you might be able to contact a local ham to help you). 5. Initial measurements for the length of antenna may be high indicating antenna is too long. Adjusting the loops by 1" will start to lower the SWR. Continue until you get lowest SWR. 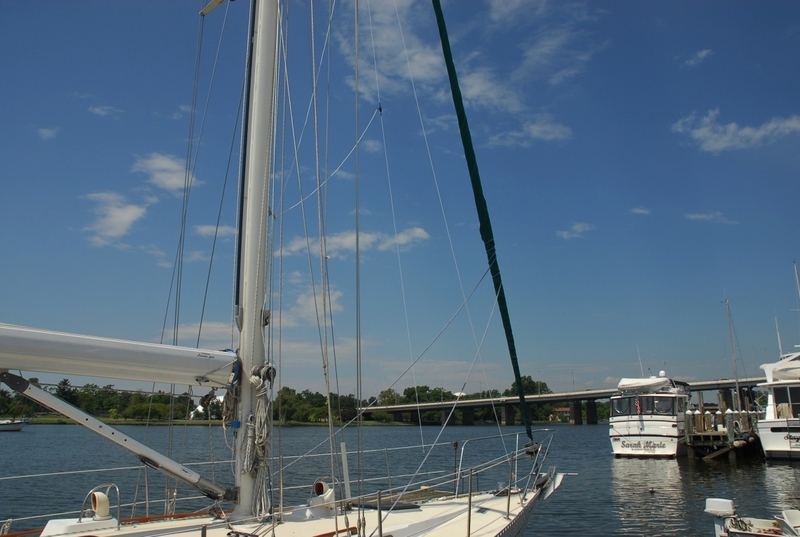 Bill uses several single band antennas on his boat. One we have talked about already, the 20 meter band antenna. The other antenna is cut for the 8 MHz Marine Band. This antenna is visible in the image at the top of the page. It is secured to the starboard toe rail just behind the pulpit. 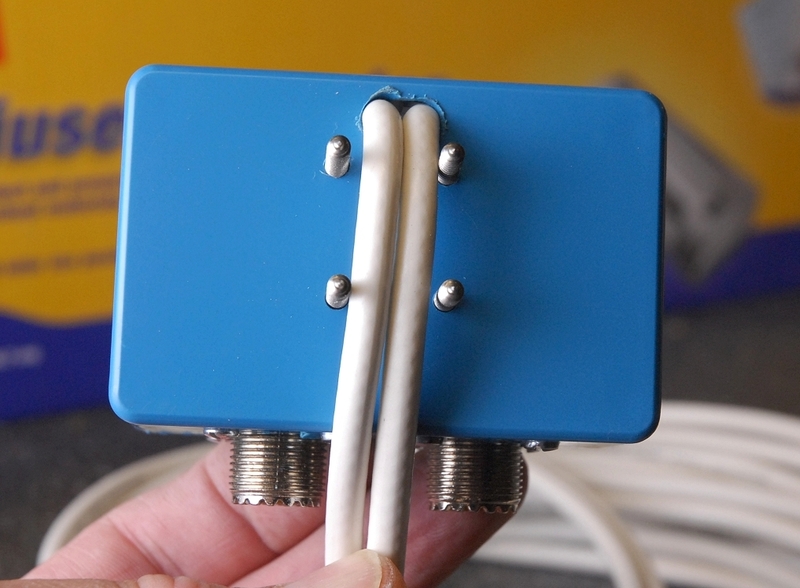 With two antennas, Bill has designed a box so that if any antenna needs to be changed, he does not have to pull the RF from below. All RF connections are done at the mast just below the boom. 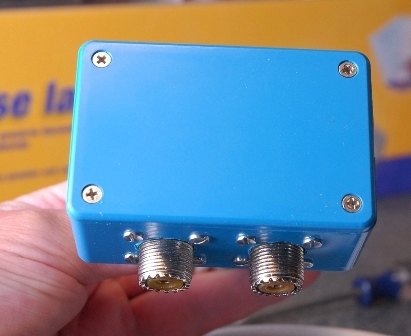 Both antenna feeds are connected to this box. The box is then hardwired to the nav station where the radios are located. Details of the box can be seen in the following images. 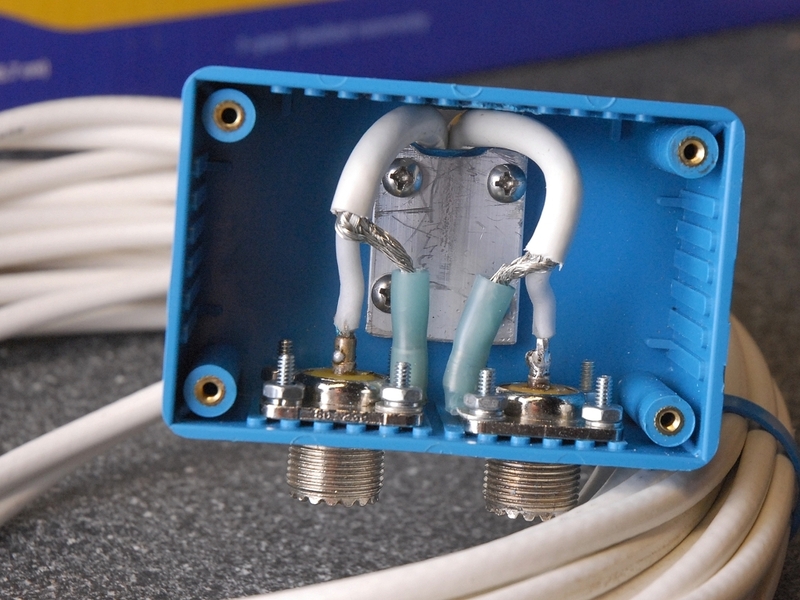 If one is only installing a single antenna, the box is still a good idea. This will allow the sailor to change antennas with having to pull wire from the radio location. Location of the Blue Box on the mast. Note the connectors for the dipoles. They are on the bottom of the box to keep out moisture. One can add a connector boot if one really needs it. Interior of the box. The cables that exit the box are led below deck to the location of the radios. In this case, Bill has two radios, one for Ham use and one for Marine use. Metal plate is used to prevent the box of cracking when securing the box to the mast. Detail of the back of the box. Keeping the box below the boom will prevent the damage to any running riggings. Details of the connector end of the box. This is the bottom. Information on this page is for personal use only. The contents and photo, charts, and spreadsheets are the property of Bill Trayfors, WA6CCA and cannot be used without written permission. This page may not be duplicated, but may be linked to. When linking, please give credit to both Bill Trayfors, WA6CCA and Brian Donaldson, KF6BL.